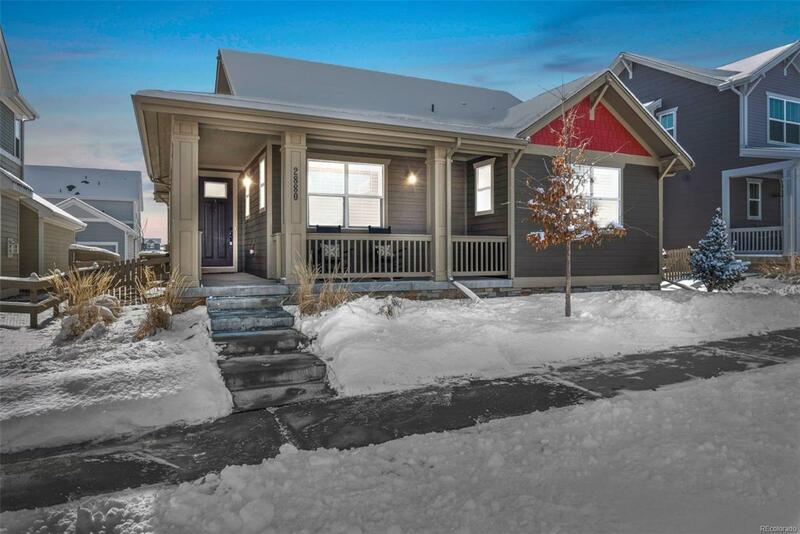 A cozy wrapped front porch welcomes you into this warmly appointed Ranch in desirable Indian Peaks South! Open floorplan has vaulted ceilings & lots of light. Less than 3 years old, TONS of features make this ranch truly spectacular: HDWD on entire main level and stairs, Quartz counters, custom built-ins and shelving in closets, laundry and garage, plantation shutters with remote black-out shades, instant hot water in baths and kitchen, whole house fan, 16 Seer A/C, spacious finished basement, privacy fencing, prof. landscaped yard, flagstone patio, planter, and seat wall. Stop paying monthly fees for home automation, this home has a built-in Savant Home Systema luxury home automation system for security, lights, thermostat, TVs, music and blinds, all controlled by remote or your phone. Enjoy 26 acres of open space, parks and pool, located close to downtown Louisville and accessed via a trail through the neighborhood. Its not often that a ranch is available in this neighborhood!